The scenery from Agawa Beach in Lake Superior Provincial Park in Ontario, Canada is picturesque as the golden glow at sunset spans across the sky and over the surface of the water before highlighting the stone man formation created on the beach. 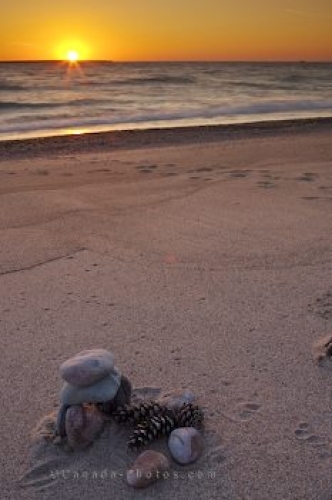 Large pine cones decorate the base of the stone man formation as footprints lead towards the water's edge farther along the beach. Agawa Beach is a beautiful place to camp during the summer months where the scenery and sunset lures many visitors to the beach during the later afternoon hours. The sandy beach spans a distance of about 3 kilometers bordered by pine trees. A fairly protected area as Montreal Island blocks out many of the larges waves which Lake Superior can churn up. Picture of a small stone man formation on Agawa Beach in Lake Superior Provincial Park, Ontario. ... , Lake Superior Provincial Park, Great Lakes, Ontario, Canada.